My good friend Eros Poli has hooked up with "La Fuga" (http://www.lafuga.cc/), a luxury cycling tour company, for a one week preparation tour for L'Etape and Mont Ventoux. L'Etape, or L'Etape du Tour, is a mass start start event like a gran fondo, which allows cyclists to ride one stage of the Tour de France. This year the L'Etape will folllow the route of the penultimate stage of the Tour de France and finish atop Mont Ventoux. 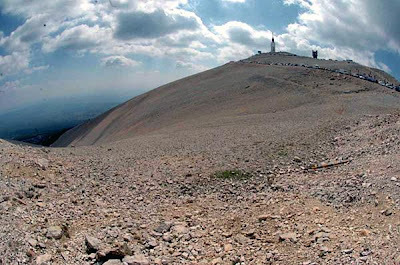 Want the inside knowledge on the challenge of Mount Ventoux? Who better than Eros Poli, winner of legendary stage 15 of the 1994 Tour de France stage where the former Olympic team time trial champion went on a 106 mile solo attack holding off Pantani and Virenque to win in Carpentras. 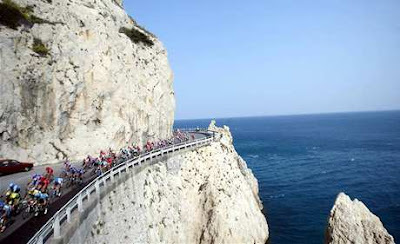 Eros is so affectionately linked with the iconic mountain that he is dubbed "Monsieur Ventoux" by French cycling fans. Eros will spend the week riding with us, passing on his knowledge gained from an eight year professional career and sharing his stories from inside the peloton. Eros will be available to answer all your questions and maybe even let you into a few pro secrets. He will also share his love of food and wine as we visit local restaurants and sample the best of Provencal cuisine and drink. With this year's l'Etape taking place over the beautiful roads of Provence and finishing at the summit of the iconic Mount Ventoux, it was an easy choice of location for our sportive preparation week. Provence's challenging terrain, beautiful scenery and world famous cuisine make it the perfect location to fine tune your Etape preparations. Our preparation week gives you everything you need to maximise your performance at your big event. And because it's a La Fuga tour, it won't be all hard work; we'll sample the best of local cuisine and enjoy a glass or two of Cote du Ventoux. Complimentary sports drinks, bars and gels. Photo: Eros suffers on Mont Ventoux on the way to stage victory when it was 37C (98.6F), a view towards the summit, Eros on the slopes of the "Giant of Provence"
Wonderous Venice will host the start of the Giro d'Italia in 100 days. 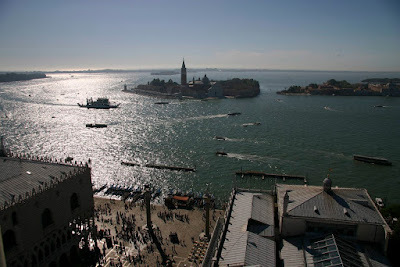 The team presentations will take place two days prior to race start in the famous Piazza San Marco on May 7th. It should be quite a spectacle. 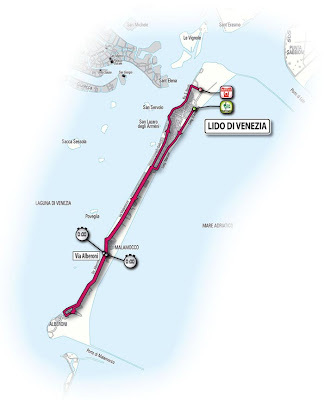 The Giro will then begin on Saturday, May 9th on the Lido, an 11 mile Venetian island separating the Venetian lagoon from the Adriatic Sea. 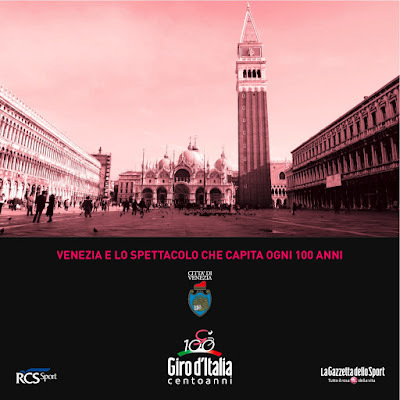 It's the only place in Venice you could possibly have a time 20.5 km team time trial. Registration for the 5th edition, September 6th, has now opened and the 4,000 slots will fill quickly. Three routes, beginning in Piacenza, are available: granfondo of 156 km with 2,700 meters of climbing, medio fondo of 125 km with 1,700 meters of climbing, and a short course of 70 km with 600 meters of climbing. Finishers in the granfondo and medio fondo are classified according to their times. The list includes 14 of the 18 ProTour teams; excluded were Cofidis, Euskaltel, Française des Jeux and Fuji Servetto. The organizer has kept two slots open for teams not yet selected. This is my 500th blog entry. I was thinking along the lines of, "What next?" After thinking about it for some time I thought it would be fun and interesting to invite others to submit stories related to, and about, cycling in Italy. 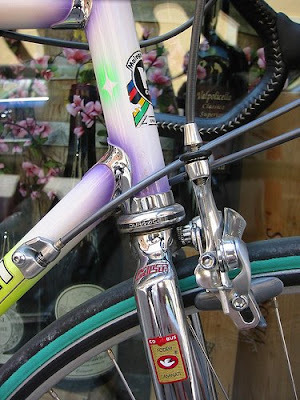 Help me make the Italian Cycling Journal the place to stop in to read about Italian cycling. A world class track facility is currently under construction in Montichiari, province of Brescia. It will be a covered facility that will seat 2,000 spectators. The track, of wood construction, will be 250 meters in length. 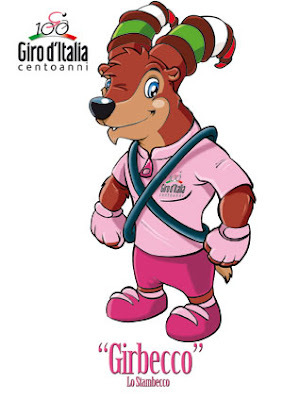 Construction is expected to be completed in Spring in time for the European Junior Championships. Above is an artist rendering of the cover (note it is shaped like a helmet), a construction photo from mid-December, and a virtual tour in video. The point of bringing this up is that Francesco Moser, who broke Eddy Merckx's hour world record in 1984, believes that Lance Armstrong may attempt an hour record attempt in Montichiari in the future. Moser's comments add to other recent news reports that the hour record maybe under investigation by Armstrong and his coach, Chris Carmichael. Armstrong to Race Milan-Sanremo, "La Primavera"
Lance Armstrong has announced that he will make his first appearance, ever, in an Italian race when he enters "La Primavera", Milan-Sanremo, on March 21st. It's the longest race of the season at 294km. The climbing on the way to the Ligurian coast is not hard. At the end of the course, however, are a series of hills that challenge the riders who have already put in over 200 km. The most famous of these are the Cipressa and Poggio. 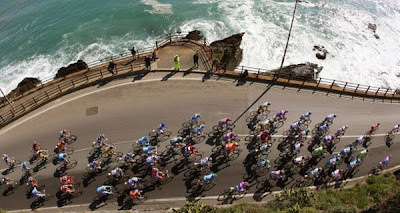 After these hills they must still preserve enough energy to sprint on the via Roma in Sanremo. 78-the number of pink jerseys worn by Eddy Merckx, exceeding Binda (59) and Franceso Moser (57). 42-the most stage wins, by Mario Cipollini who broke the record of Alfredo Binda (41 stage wins). Friday, January 23rd: Today we had a one day warm spell with temperatures rising into the 40s after which they were going to plunge again. I hadn't ridden outside since January 6th, I was desperate to get out riding. I like to vary my rides so typically I go on new routes and roads on every ride. Today, I found a farm that sells fresh eggs year round. I'll have to try those. Which reminds me that I have to go back to the farm that sells buffalo burgers that we passed on a summer ride and pick some of those up. 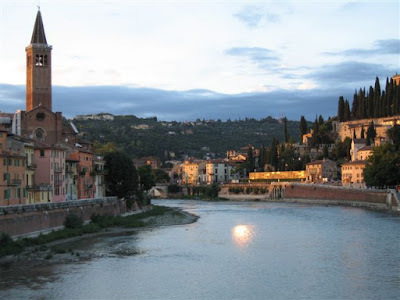 Old readers of my blog know that I lived in Verona, Italy. 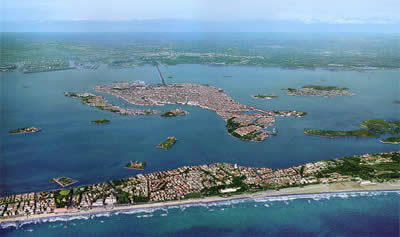 A beautiful city to visit and live. 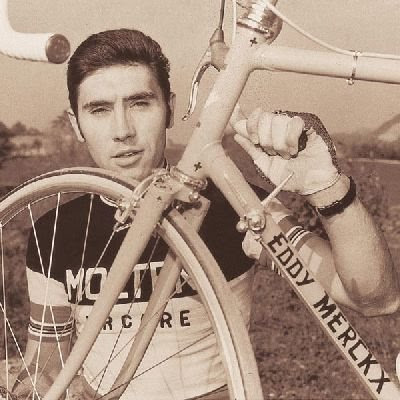 BICYCLING magazine is having an essay contest in which the prize is an Eddy Merckx bike and an all expenses trip for two to Verona to enter the Granfondo Eddy Merckx on June 2nd. All you need to do is write 50 perfect words. OMG, I'll be wracking my brains. 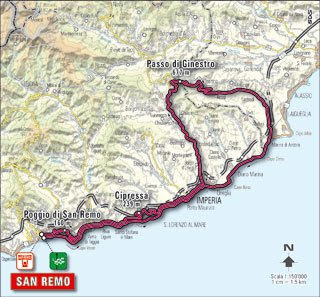 The granfondo will be of 148 Kms with 1.740 meters of climbing. 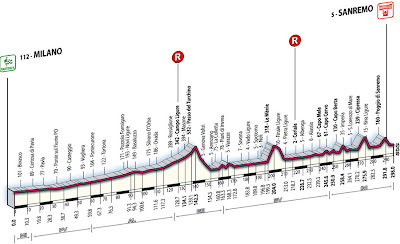 For those not ready for that a mediofondo of 90 Km with 490 meters of climbing is available. 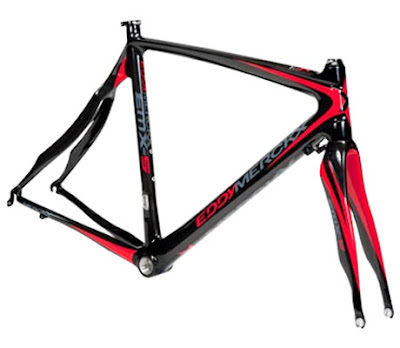 Details of the contest are at:http://www.bicycling.com/cda/contestsandsweepstakes/1,7583,s1-21-0-0-3,00.html?urlID=9462 Read the rules! It's nice to learn of the launch of a small business that is making sewn leather handlebar wrap, in 7 colors in smooth leather and suede, available. Cico Di Cuoio is offering a complete, easy to use, kit. 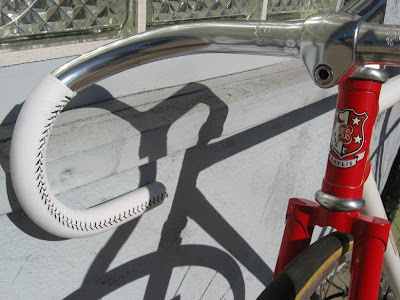 They also offer a service where you can send your handlebars to them and they will do the installation. See http://www.ciclodicuoio.com/ for details. My Verona-made Lucio Malagnini was delivered with leather wrapped handlebars, comfortable and classic. .........."O Sole Mio" at a dinner at the 2008 Eurobike show in September. He is pretty good! 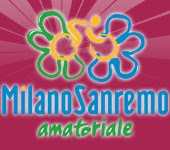 The place to learn of randonneuring events and brevets in Italy is http://audaxitalia.com/ which is the website of Audax Italia. 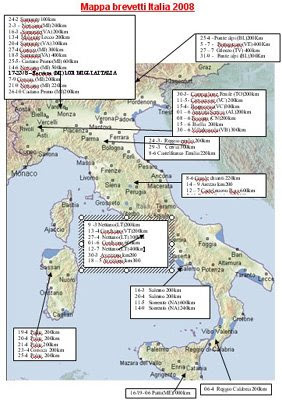 The site is in Italian but it's easy to navigate. If you have questions you can contact the organization by clicking on CONTATTA and entering on the form your name (nome), email address, and your message (messaggio). The home page features many of the events and under the BREVETTI button you can find a detailed calendar which is divided by ACP (Audax Club Parisien) and non-ACP events. The above photos are of the Passo dello Stelvio climb and were provided by the Sport Hotel Veronello. The Hotel Veronello, near Lake Garda, caters to cyclists and these photographs came from one of the trips they organized for guests. In the summer of 2006 I climbed the Stelvio with my cycling club, Gruppo 1 of Verona (http://italiancyclingjournal.blogspot.com/2007/03/looking-back-climbing-famous-stelvio.html). The club had a saying that went along the lines of, "If your feet touch the ground you can't claim you climbed the Stelvio." Therefore, on that trip there wasn't going to be any photography by me on the way up but I did take a few photos about half way down on the descent. I've arranged these excellent photos, which you can click on to enlarge, in the order of what you would see as you climbed the Stelvio. The Passo dello Stelvio at 2757 m (9,045 feet) is the highest paved mountain pass in the Eastern Alps, and the second highest in the Alps. Of course, it is famous with cyclists as epic battles have been fought here in the Giro d'Italia and as a measure of personal achievement. The climb begins simply enough on a small road out of Prato. Then, there is a pretty stretch with a cascading river on your right. Soon you come to the first "tornante" (switchback) sign, numbered 47. You climb through a wooded area before coming out into the exposed side of the mountain. On the opposite side is a beautiful glacier. Once you exit the woods and are on the exposed section of road you can see all the switchbacks leading to the top. It's a daunting sight. I decided it was best to keep my eyes on the road immediately ahead. Looking all the way up....well, it just seemed it would be impossible to get to the top. Keep in mind that this is a a climb of 15.1 miles (24,3 km) with an average gradient percentage is 7.4 %. To all my friends that I tried to come to ride with me: See what you missed?! I could be persuaded to go back though. 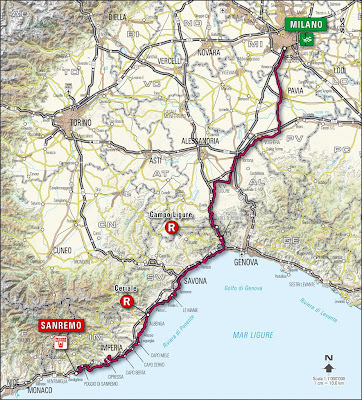 A Unique Bike Tour: All of the Giro d'Italia!